Here at GrafCaps, we've thoroughly studied the intricate details of graffiti caps. We've come up with our own terminology, which we use throughout this site to accurately illustrate the features and differences among our products. We want you to be well informed, so here are some terms that we use in many of our cap descriptions. The hood makes up the majority of the graffiti cap. It is the large plastic portion of the cap that you press on with your finger to make the paint come out of the can. Hoods come in various shapes, sizes and colors. They consist of either one piece or two pieces. One-piece hoods are made of one solid piece of injection molded plastic. Two piece hoods have a separate stem, one end of which fits into the paint can and the other end of which fits into the main body of the hood. Large hoods usually have a number stamped inside of them, though that number does not seem to correspond with the type of hood. We believe it is an identifying marker used in the manufacturing process to correspond to a particular production run. Nozzle - What makes a fattie or a skinny? 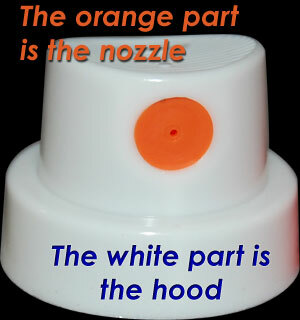 The nozzle is the smallest, arguably most important part of a graffiti cap. It is the small, colored insert, which fits into the hood. It is the "dot" in a pink dot (or any other cap for that matter). The nozzle is responsible for determining the final shape of the spray. It is ultimately what gives a fat cap it's broad angle of coverage, and a thin cap it's narrow angle of coverage. Some nozzles have a flat front surface, while others are indented. In the case of gold dots, you can distinguish between the "outline special" and the "super skinny" varieties by looking at the nozzle. Outline specials have flat nozzles while super skinnies have indented nozzles. Some nozzles have tiny numbers on them. Like the numbers stamped on the hoods, we believe they are used in the manufacturing process to correspond to a particular production run. The final piece of the graffiti cap puzzle is the stem. Not all caps have stems. This is the difference between "male" and "female" caps. Male caps have a little tube that sticks down into female spray paint cans. Female caps, on the other hand, don't have a stem. They have a hole in the underside of the hood to accept the stem, which sticks out of male spray paint cans. On most male caps, the stem is part of the hood, and cannot be removed. In this case, there is a small slit up the side of the stem. Depending on the cap type, some of these slits are wider than others. Then there's the case of the male cap with a removable stem. On this type of cap, you can actually use a needle-nose pliers to pull the stem out of the hood, thus converting the male cap into a female cap (see the diagram above). The stems on these hermaphroditic caps don't have the same slit in them as seen in standard male caps. They are a more tube-like in nature. Now you know more than you ever wanted to about spray paint caps. Freakin' amazing huh? Just goes to show you, even something as simple as a spray paint cap is an engineering work of art.